Find insider news, helpful restaurant marketing intelligence, career strategies and business tactics, and of course interviews with master chefs like Chris Lee, Cat Cora, Charlie Trotter and more in Food and Beverage Today. Meet Master Chef Christopher Lee, join our very own culinary wanderer Jack Yoss, as he explores Alaskan seafood from the long end of a fishing pole, step inside the Jacksonville restaurant scene, plug into the hottest trends in the restuarant business today, visit with the industry's top marketing masterminds and get all your industry insider news in the September/October issue of Food & Beverage Today. Traveling chef Jack Yoss reports on Alaskan seafood from the end of a fishing rod. Jacksonville restaurants are hot. The dining scene is as progressive as Jacksonville itself. Join us as we uncover the best restaurants in Jacksonville. Goat meat is gaining popularity in the US, but that 's just a small fraction of it's popularity worldwide. We visited with Bill Niman to get his take on goat. In 2004, Cindy Cosco moved to the Bay Area to pursue her winemaking passion after a fifteen-year career in law enforcement. Here's her story. When dollars are tight, using the Web to secure good press makes great sense. A few resources make it much easier. Food and Beverage Today serves the restaurant business, culinary, f&b and hospitality industries. 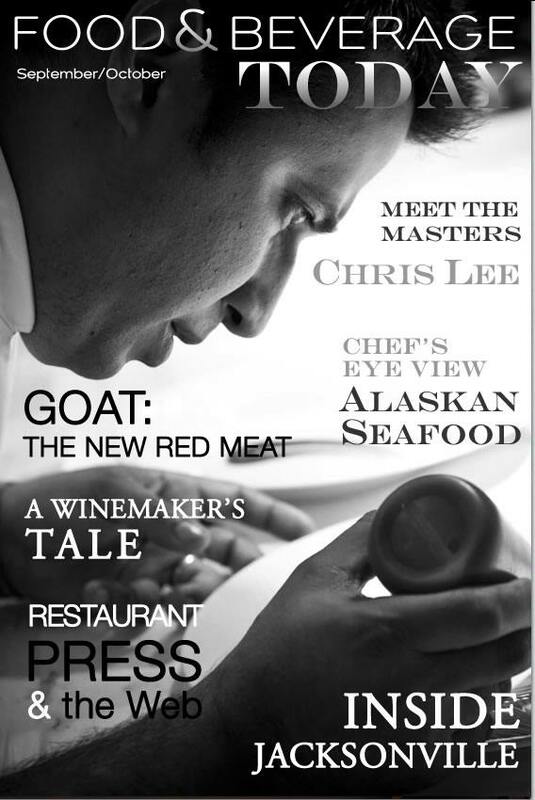 Spanning topics such as restaurant marketing and publicity to career advancement for chefs and culinary scool insider reports, each issue focuses on the business side of food and wine. We hope you enjoy this issue and find it to be both entertaining and helpful to you as a food and beverage professional. We're here for you so drop us a line and let us know how we're doing.